Free Resource for Educational Settings/Use. 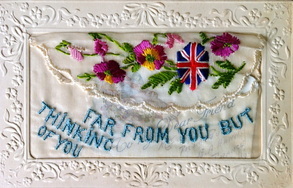 Visit the First World War Postcards page to find out more details. "The only real failure is the failure to try and the measure of success is how we cope with disappointment...as we always must. We came here and we tried. All of us in our different ways. Can we be blamed for feeling that we are too old to change? Too scared of disappointment to start it all again. But it's also true that the person who risks nothing, does nothing, has nothing. All we know about the future is that it will be different, but perhaps what we fear is that it will be the same. So we must celebrate the changes because, as someone once said, everything will be alright in the end...and, if it's not alright, then trust me, it's not yet the end." Challenging, thought-provoking read. So many themes woven together. Find out more about the book and author. Apparently if you manage to find the special edition of this book, you can eat it - printed on edible paper with vegetable inks. One of my all-time favourite picture books. Works for learners of all ages. Visually stunning. Atmospheric. Possible one of the scariest picture books for children. Free Resource: Live broadcasts to UK Schools. For more information, check out the RSC website. Take a look at class tools.net for a variety of classroom resources, including a random name generator and a QR treasure hunt creator. For those of you who know us well, you will recall that our search for restaurants and coffee shops that cater for specific dietary requirements is extensive. Pret A Manger is a recent discovery. There are 2 specific reasons for this. The first is the iPhone free app - easy to use, but more specifically it allows you to filter the menu according to numerous dietary requirements. The second is the Pret A Manger philosophy and ethics. It is worth taking the time to find out a bit more about them. Whether you enjoy this sort of music or not, it is a fantastic example of creativity - taking the elements of something that already exists and creating something new in a different context. We are constantly in awe of what can be achieved.